Before he established the winery in 2002, for nearly 15 years, Jean-Pierre Robinot offered, to its customers, natural wines in his Paris wine bistro-restaurant called: "l'Ange Vin" (literally "Angel Wine", but more especially a play of words for the word "Angevin", which is the name of the local people from the Anjou region, or the town of Angers, capital of Anjou, like Jean-Pierre). Fascinated by the natural wines in general and the Loire wines in particular, he returned to his native village of "Chahaignes", located in the Sarthe, about 100 kilometers northeast of the city of Angers and 6.5 kilometers northwest of the village of "La Chartre sur le Loir", halfway between Le Mans and Tours, to establish a vineyard and craft natural wines from the "Vallée du Loir" (and no, this isn't a mistake). Not to be mistaken with the "Vallée de la Loire", the "Vallée du Loir" is the valley formed by the banks of the "Loir" river, a tributary of the "Sarthe" river, taking its source west of Chartres, north of Illiers-Combray. The "Loir" joins the Sarthe river in Briollay, a village north of the city Angers, which in turn joins the Maine river that finally fall into the Loire. The vineyards of the Loir Valley begins with the AOC Coteaux du Vendôme, through the AOC Jasnières ending with the AOC Coteaux du Loire. The production area consists now of 400 hectares, while many centuries ago, 5,000 hectares of vines were planted and used; but with time, some sites were abandoned and most others were mainly destroyed by the Phylloxera plague between 1860s and 1930s. In 2002, he started to acquire quite a few plots of fallow lands in the appellation Coteaux du Loir, not planted over a century for some. Within the first few years, and the intention to slowly and gradually build his Domaine and after a first clearing operation, it already planted two hectares of vines in the appellation Coteaux du Loir. It also took care of some other vines planted on AOC Jasnières and AOC Coteaux du Loir red. Now, he possesses about 10 hectares of lands on steep slopes, which include great Terroirs. The objective he set for himself is ambitious: organic farming and natural winemaking and vinification processes, with yields limited to 25 / 30 hectoliters per hectare to obtain great complexity. The ground is plowed, the plants are fed with natural composts and weeding chemicals are banned. Vinification is done slowly, with almost no sulfur or without the addition of other products. White wines from the Chenin grape are very gently pressed. They are aged on their lees in oak barrels for at least 12 months. The red wines are from the Pineau d'Aunis grape variety. After a long fermentation, they finish their ageing on the lees in oak barrels for at least a year. The resulting wines are very long and complex with great ageing potential, because of their great balance and structure. Yet, last updated by the end of 2009, the winery website doesn't do any favors to Jean-Pierre, in the sense that not all produced wines are represented on it. 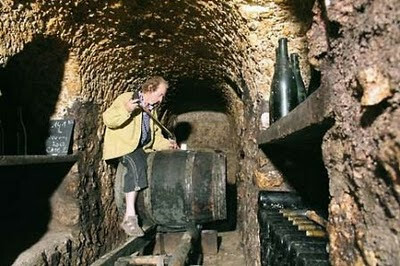 Hence, it is difficult to really realize how many wines he, in fact, produces. Only five appear on the website now (Lumiere de Silex, Jasnieres, Le Regard du Loir, Alter & Go, and Concerto d'Oniss), yet, "Les Années Folles" isn't there, "Symphonie du Temps"and "Cuvée Juliette Robinot" either. In fact, there are a few more Cuvées than those; but it seems that it depends of the quality of the vintage and of his mood too. Jean-Pierre is definitely a personage, who makes great wines that need a bit more coverage. His grapes come from the different AOC(s) of the Vallée du Loir on which his vineyards are planted, yet they are mostly labeled Vin de Table or Vin de Pays due to the fact that his wines are so, ... somewhat atypical and certain of their features don't get along with the less generic AOC rules. I will take a picture of the label when the wine will be at the store, because I forgot when I tasted it and the label for this particular wine changes depending on the vintage. To be completed soon. "Les Années Folles" is a natural "Pétillant" (lightly sparkling wine), made by Méthode Ancestrale, with disgorgement done by hand and no addition of dosage with sugar, just a refill of the bottles with the same wine, which makes it fairly dry. He makes about 160-200 cases at the most of this wines, depending of the vintage. A blend of 80% Pineau d'Aunis and 20% Chenin Blanc from the AOC Jasnières, the light pinkish hue in the glass comes from minimal skin contact of the Pineau d'Aunis, a red grape variety, also locally known as "Chenin Noir", indigenous and predominantly grown in the Loire Valley, more especially in the Anjou and Touraine region. Behind its medium light yellow-pinkish color, "Les Années Folles" (the crazy years) offers a funky nose where yeasty, farmy aromas intermingle with goat cheese, nutty, apple and yellow core fruit notes. The palate is much more attractive and inciting than the nose, which is definitely very interesting, yet could be slightly off putting at first, for some people. It presents freshness, great acidity, lovely balance and texture. Excellent in my opinion, this natural wine will surely generate mixed opinions, but it is worth trying and be surprised. Info taken, translated and edited from the winery website at http://lesvignesdelangevin.vinsnaturels.fr and from a discussion with Zev Rovine when he came to the store to taste us on a few wines from his portfolio. Your retail price is less than the wholesale price. Any way to get his email?